After a wonderful final banquet with our Hadley China hosts, we got up early to head to Beijing. 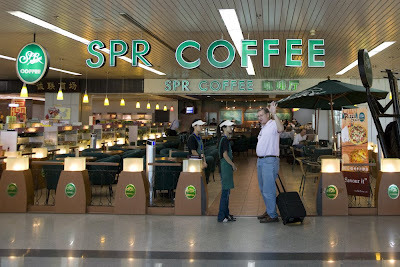 I was impressed in the airport by a Starbuck's knockoff (check out the color scheme and typefont of SPR Coffee). I ordered a latte and was surprised to find I had just bought a US $12 cup of coffee. 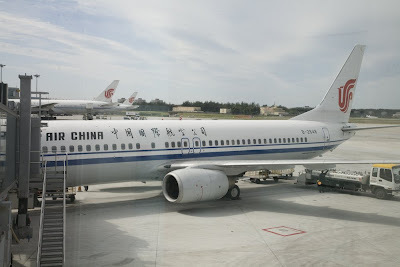 Our flight from Fuzhou to Beijing was thankfully uneventful! In Beijing, we planned on combining visiting disability organizations along with a little bit of regular sightseeing. 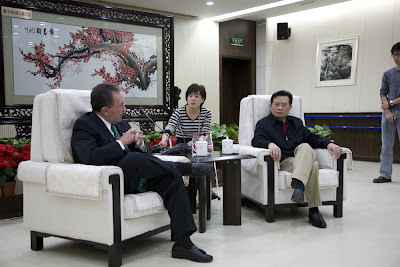 The first disability group we visited was the China Disabled Persons' Federation, which is the main national group. It was founded by Deng Pufang, the son of former Chinese leader Deng Xiaoping. I was a bit surprised that CDPF was pretty dedicated to advancing the rights of people with disabilities, but seemed notably unenthusiastic about the idea of blind people going to university. We had noticed that there were no blind people at one of the big universities we had visited in Fuzhou. There is still a feeling that blind people should become massage therapists. I actually got my first massage ever in Fuzhou at a blind massage place. Many of Hadley China students are massage therapists trying to upgrade their skills by speaking English. English-speaking masseurs command higher wages because they can work with foreigners. Chuck Young recently sent me an article about blind massage in Korea: the profession is supposed to be reserved only for blind people there. Rami gently brought up these topics during many of our visits, by asking about how blind people were educated about career options. We were accompanied on most of our Beijing visits by Lian, a Hadley alum who had gone to the U.S. to get her university education. She now owns a furniture factory outside Beijing with 30 employees, as well as a shop in Seattle. But, change will take time here. I am optimistic that going to university will increasingly become the rule instead of the exception for capable blind people in China. Jim, if you're still in Beijing when you read this and you have any spare time, get in touch with One Plus One Cultural Exchange Centre, who are a group of visually impaired people (and one in a wheelchair) who run a radio station. Click on oneplusone.org.cn to see their web site. There is English there. I am in the UK, but I am part of a not for profit organisation 'China Vision' who have helped in the training of these fantastic visually impaired people. They also have 'equal opportunities' training from us. If you do manage to get in touch with them ask for Jin Ling who speaks excellent English and tell them you heard about them from me as I saw your Blog in my ever hopeful search for news about the visually impaired worldwide. this is for a project which they also know about : a newsletter which is sent out to people who are visually impaired or people within the education system in China. I find the english materials and they're sent to someone else - not in this Centre - to translate into Mandarin, with the english kept for those who read English, and the whole lot is turned into a fortnightly newsletter. Hope you manage to meet my wonderful group of friends.